I have mixed feelings about writing about what happened in Moore, OK, this week. 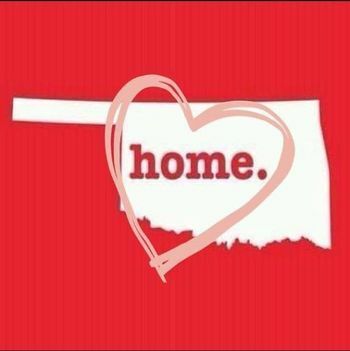 I grew up in Oklahoma, have family in Oklahoma and identify with Oklahoma, but I don't want to inappropriately attach myself to Oklahoma just because it's in the news. (Similarly I didn't write about Boston after the marathon bombings, or Connecticut shootings, etc.) I still feel like writing though and I'm going to focus on my own experience with Oklahoma weather rather than trying to have anything worth reading about what happened this week. So growing up I did have experiences preparing for tornadoes -- but it almost seemed like a joke. My little town is situated on a hill, there are some low mountains to the north and another small town to the west. The weather almost always travels west to east, so it just seemed unlikely that our town would be hit. So far in my life it hasn't been. Knock on wood, cross your eyes, etc. The town is so small that there are no tornado sirens -- at least there weren't when I was a kid. We just watched the news -- or listened to the radio if the electricity went out -- and packed a bag to take to the cellar. Most of my bags were full of toys. And it always seemed exciting. As a teenager it really was a joke. I had told my then-boyfriend about how we prepared for tornadoes with frantic packing, and it struck us both as absurd and funny. If weather hit while we were at school the line would be "You better go pack your bags!" What lame teenagers who felt invincible I guess. Anyway, once weather did hit while I was at school -- I was probably younger than a teenager, but I remember filing down to the basement-level dressing rooms with the rest of the kids. We were down there but oddly not scared. Probably because we were just kids and unaware of the risks. It was hot and stuffy in the dressing room (it always was, but we were down there a long time). There wasn't actually a tornado but high winds messed up the high school roof. The cellar at our house seems really awful now -- it's probably half-full of water most of the time (except during the worst parts of the drought I guess) and definitely doesn't seem safe. I don't really make it a practice to check on it when I'm home. Creepy crawlies down there too! I love rain and storms though, even though they are scary and powerful. I find them so refreshing and somehow comforting. But then I've never lost anything after a storm, and I can't imagine the depth of that pain. Reconsidering tornado procedures at your Alma mater. Superintendent Voegeli told us that the children who died at school in Moore were trapped in the basement when the building above crumbled down on them and then water pipes broke and filled the basement. That could happen to us. One plan is, if we have time, to bus the kids to the Mennonite Church. They have an underground safe room built in a field with nothing above it. She is also going to look for grants to build a safe room at school. I too feel like the mountains offer us protection. I don't think there has ever been a tornado here in recorded history, ie, post 1900. If there had been, someone would have said, "I remember when my grandpa lost everything in the tornado of 1913." Still, it might happen. If so, look for me in the bathtub because I'm not going in the cellar. Daryl has seen snakes in it!